As the 83rd Texas Legislative Session looms on the horizon, the Showdown for the Texas House Speaker begins to take form. The 2011 session gave Texas Tea Party conservatives a glimpse of the past. A time when elected leaders were actually guided by moral clarity and PRINCIPLE – what a concept! On January 11, 2011, 15 Texas Representatives were guided more by their heart than by their campaign coffers OR their egos. For that conviction they were honored by their fellow conservatives and Texas Tea Party supporters. How refreshing it was that day to believe that at least in the Great State of Texas, 15 elected Representatives took a stand for what was BEST for future generations of Texans and not their own personal gain. The “Texas 15 – Hall Courage” was launched by WomenOnTheWall.Org in 2011 to signify a step towards ending the corruption in the Texas House. Many true conservatives were proud to honor those who took a stand. That day – that vote, showed Texans that there were still men and women in office who believed in Judeo-Christian principles, the Constitution, LIFE, the rule-of-law, and responsible/accountable/transparent government. With their votes, the “Texas 15” were no longer just politicians. On that day, they represented the fighting spirit of the Texas Tea Party by taking a stand to draw a line in the sand against power and corruption. The “Texas 15” and the rest of the Republican House members (a/k/a RINOS) who cast those memorable votes for Texas House Speaker in 2011 will live on for decades in the history of the Texas Legislature. Odd, what a difference a few years can have on one’s view of reality. How quickly people in power forget how they got where they are OR where their loyalty should rest! How easily they lose sight of the fact that their constituents elected them to do what will keep Texas strong and prosperous for future generations and not what might make THEM more important for the moment. Straus will NEVER forgive anyone who voted against him in 2011 – EVER! Sure, he may “make nice” by granting coveted committee appointments to some but that is as far as it will go. As we now know, talk is cheap – especially the talk of Texas House Speaker Joe Straus! Given the recent Texas redistricting retribution against key Texas conservative Representatives (like Rep. Wayne Christian, Rep. Jim Landtroop, and Rep. Erwin Cain) it is hard to understand why ANY of the 2011 “Texas 15” would ever even entertain the thought of supporting a man like Straus. Amazing how the Speaker referenced retribution as unacceptable behavior as he took to the microphone to gloat about his re-election in 2011. It appears retribution is only unacceptable behavior when it comes from the grassroots who oppose him. Emails prove that different rules seem to apply to the Speaker’s team and his cronies. The recent article in The Dallas Morning News by Bob Garrett, stated that three (3) of the “Texas 15” were defeated which is not entirely accurate. All of the referenced defeats were due to REDISTRICTING RETRIBUTION by Joe Straus – payback for their votes against him in 2011. Specifically, Rep. Erin Cain decided not to run against his fellow House member Dan Flynn once they were paired in redistricting. Speaking of redistricting retribution (and don’t forget legislation woes) – it seems the Democrats have a similar tunes they are singing about their old friend Joe. Texans from both sides of the aisle seem to desire reform and transparency in the people’s House. Even if Straus attempted to lure his 2011 defectors back to his camp with key committee chair positions, could any of the “Texas 15” possibly believe for one moment that he would allow them to successfully pass ANY vital conservative legislation that they truly care about? To simplify things, the answer is NO and if any think otherwise they should be booted out of office. While many will hold up the 2011 Sonogram legislation passage as an example of how far Straus has come in his “pro-life walk,” The Texas Tribune a few days ago referenced his response when he was asked about the passage of a “fetal pain measure” Gov. Perry has been touting. The Tribune reported, “… Straus declined to say whether he would support it, but strongly implied that he doesn’t view the proposal as a priority.” REALLY – not a priority!! Legislation which would ban abortions after 20 weeks isn’t considered a “priority” by our “pro-life” Speaker who was endorsed by the main pro-life groups in Texas? Something doesn’t pass the smell test here folks. On that note, for all of the other members of the Texas House who ran as pro-life candidates – a serious gut check best be in order before casting a vote for Joe as House Speaker. Much more on this subject in the Part 2 so check back for more exciting examples. I suppose some will speculate as to how Straus might treat any “Turncoat” of the “Texas 15” who cast their vote for him as Speaker in 2013. There is no speculation as to how the Texas Tea Party nation and true conservatives across Texas would react to any such “Turncoat” – rest assured they would move to a priority position in the list of legislators to unseat in 2014. You see, it is really pretty simple! A candidate can’t claim to be a true conservative one year while electioneering and then decide after they are elected that everything they professed was ingrained in their heart (and ours) was really not important or worth fighting for after all. Again, Texas Representatives are faced with the 2011 battle cry, “Conservative Speaker OR Your Seat.” They should seriously take that promise to heart. 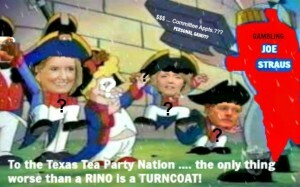 Frankly speaking, to true conservatives – “Turncoats” are far worse that RINOS could ever be!